Wind and precipitation, warming and cooling depend on how much energy is in the atmosphere and where that energy is located. Much more energy from the Sun reaches low latitudes (nearer the equator) than high latitudes (nearer the poles). These energy differences cause the winds, affect climate, and even drive ocean currents. Heat is held in the atmosphere by greenhouse gases. Describe how energy is transmitted. Describe the Earth's heat budget and what happens to the Sun's energy. Discuss the importance of convection in the atmosphere. Describe how a planet's heat budget can be balanced. Describe the greenhouse effect and why it is so important for life on Earth. Figure 15.9: Waves. The high points are the crests, the low point is the trough. The wavelength is the distance from crest to crest. Every material has energy: All the molecules within it vibrate. Gas molecules contain more energy than an equal number of liquid molecules (under the same temperature and pressure conditions) and move freely. Liquid molecules contain more energy than solids and move more freely than solids. Energy travels through space or material. You know this because you can stand near a fire and feel the warmth. In this situation, energy is being transferred as invisible waves that can travel through air, glass, and even the vacuum of outer space. These waves have electrical and magnetic properties, so they are called electromagnetic waves. The transfer of energy from one object to another through electromagnetic waves is known as radiation. Different types of electromagnetic waves have different wavelengths. A wavelength is the horizontal distance from trough-to-trough or crest-to-crest of adjacent waves (Figure 15.9). Humans are able to see some wavelengths of light, the wavelengths known as 'visible light'. These wavelengths appear to us as the colors of the rainbow (Figure 15.10). The longest wavelengths of visible light appear red and the shortest wavelengths appear violet. Wavelengths that are longer than visible red are infrared. Snakes can see infrared energy. We can record this with special equipment. Wavelengths that are shorter than violet are ultraviolet. Infrared and ultraviolet wavelengths of energy are just as important as the wavelengths in visible light; we just can't see them. Figure 15.10: The electromagnetic spectrum showing the wavelengths of energy. Solar radiation that reaches the outer atmosphere includes radio waves, along with visible light plus the ultraviolet range nearest to violet and the near infrared. Other wavelengths of electromagnetic radiation are blocked by different parts of Earth’s atmosphere. Some objects radiate electromagnetic waves in the visible light spectrum. Two familiar sources are the Sun and a light bulb. Some objects radiate electromagnetic waves at wavelengths that we cannot see. The glass of water sitting next to you does not radiate visible light, but it does radiate a tiny amount of heat. You should be aware that some objects appear to radiate visible light, but they actually do not. The moon and the planets, for example, do not emit light of their own. They reflect the light of the Sun. Reflection is when light bounces back from a surface. Albedo is a measure of how well a surface reflects light. A surface that reflects a high percentage of the light that strikes it has high albedo and one that reflects a small percentage has low albedo. One important fact to remember is that energy cannot be created or destroyed. It can only be changed from one form to another. In photosynthesis, for example, plants convert the Sun's energy into food energy. They do not create new energy. When energy is transformed, often some becomes heat. Heat transfers between materials easily, from warmer objects to cooler ones. If no more heat is added, eventually all of a material will reach the same temperature. Temperature is a measure of how fast the atoms in a material are vibrating. High temperature particles vibrate faster than low temperature particles. Rapidly vibrating atoms smash together, which generates heat. As a material cools down, the atoms vibrate more slowly and collide less frequently. As a result, they emit less heat. What is the difference between heat and temperature? Temperature measures how fast a material's atoms are vibrating. Heat measures the material's total energy. Think of a candle flame and a bathtub full of hot water. Which has a higher heat and which has a higher temperature? Surprisingly, the flame has a higher temperature, but much less heat because the hot region is very small. The bathtub has lower temperature but contains much more heat because it has many more vibrating atoms. Even though it’s at a lower temperature, the bathtub has a greater total energy. Heat is taken in or released when an object changes state, or changes from a gas to a liquid or a liquid to a solid. This heat is called latent heat. When a substance changes state, latent heat is released or absorbed. A substance that is changing its state of matter does not change temperature. All of the energy that is released or absorbed goes toward changing the material's state. For example, imagine a pot of boiling water on the stove: that water is at 100 °C (212 °F). If a cook increases the temperature of the burner beneath the pot, more heat enters the water. But still the water remains at its boiling temperature. The additional energy goes into changing the water from liquid to gas. This allows the water to evaporate more rapidly. When water changes from a liquid to a gas it takes in heat. Since evaporation takes in heat, this is called evaporative cooling. Evaporative cooling is an inexpensive way to cool homes in hot, dry areas. Substances also differ in their specific heat, the amount of energy needed to raise the temperature of one gram of the material by 1.0 °C (1.8 °F). Water has a very high specific heat, which means it takes a lot of energy to change the temperature of water. Let's compare a puddle and asphalt, for example. If you are walking barefoot on a sunny day, which would you rather walk across, the shallow puddle or an asphalt parking lot? Due to its high specific heat, the water stays cooler than the asphalt, even though it receives the same amount of solar radiation. Figure 15.11: An image of the sun taken with a sensor picking up only the 17.1 nm wavelength, in the ultraviolet wavelengths. Most of the energy that reaches the Earth's surface comes from the Sun. The Sun emits energy in a continuous stream of wavelengths (Figure 15.11). These wavelengths include visible light, infrared, ultraviolet radiation, and others. About 44% of solar radiation is in the visible light wavelengths. When viewed together, all of the wavelengths of visible light appear white. But a prism or water droplets, for example, can break the white light into different wavelengths so that you can see separate colors (Figure 15.12). Figure 15.12: A prism breaks apart white light by wavelength so that you can see all the colors of the rainbow. 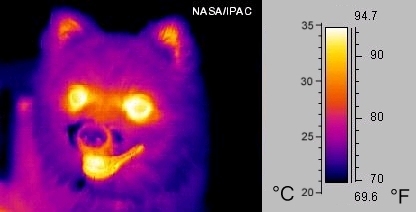 Figure 15.13: An image of a dog taken by an infrared sensor. The image shows the different amounts of heat radiating from the dog. Only about 7% of solar radiation is in the ultraviolet (UV) wavelengths. Of the solar energy that reaches the outer atmosphere, UV wavelengths have the greatest energy. There are three types of UV energy: UVC has the shortest wavelengths and is the most energetic; UVA is the longest wavelengths and is the least energetic; and UBV is in the middle of the two. UV radiation will tan or burn human skin. The remaining solar radiation is the longest wavelength, infrared. Most objects radiate infrared energy, which we feel as heat (Figure 15.13). Some of the wavelengths of solar radiation traveling through the atmosphere may be lost because they are absorbed by various gases (Figure 15.14). Ozone, for example, completely removes UVC, most UVB and some UVA from incoming sunlight. O2, CO2 and H2O also filter out other wavelengths from solar energy. Figure 15.14: In the atmosphere, gases filter some wavelengths from incoming solar energy. The yellow field shows the wavelengths of energy that reach the top of the atmosphere. The red field shows the wavelengths that reach sea level. The amount of radiation is reduced overall as different gases filter out different wavelengths. Ozone filters out the shortest wavelength ultraviolet and oxygen filters out most infrared, at about 750 nm. Different parts of the Earth receive different amounts of solar radiation. This is because the Sun's rays strike the Earth's surface most directly at the equator. As you move away from the equator, you will notice that different areas also receive different amounts of sunlight in different seasons. But what causes the seasons? The Earth revolves around the Sun once each year and spins on its axis of rotation once each day. This axis of rotation is tilted 23.5° relative to its plane of orbit around the Sun. The axis of rotation happens to be pointed to the star Polaris, or the North star. As the Earth orbits the Sun, the tilt of Earth's axis stays lined up with the North star. This means that the North Pole is tilted towards the Sun and the Sun's rays strike the Northern Hemisphere more directly in summer. At the summer solstice, June 21 or 22 of each year, the Sun's rays are hit the Earth most directly along the Tropic of Cancer. This is a circle of latitude exactly 23.5° north of the equator. When it is summer solstice in the Northern Hemisphere, it is winter solstice in the Southern Hemisphere. Winter solstice for the Northern Hemisphere happens on December 21 or 22. The tilt of Earth's axis points away from the sun in the winter and the Sun's rays strike most directly at the Tropic of Capricorn (Figure 15.15). The Tropic of Capricorn is a line of latitude exactly 23.5° south of the equator. The light from the Sun gets spread out over a larger area, so that area isn't heated as much. There are also fewer daylight hours in winter, so there is also less time for the Sun to warm that place. When it is winter in the Northern Hemisphere, it is summer in the Southern Hemisphere. Figure 15.15: Arctic winter solstice. The sun's rays are directly overhead at the Tropic of Capricorn. Sunlight is striking the south pole, but it is spread out. No sunlight is getting to the North pole. Halfway between the two solstices, the Sun's rays shine most directly at the equator. We call these times an 'equinox' (Figure 15.16). The daylight and nighttime hours are exactly equal on an equinox. The autumnal equinox happens on September 22 or 23 and the vernal or spring equinox happens March 21 or 22 in the Northern Hemisphere. Thus the seasons are caused by the direction Earth's axis is pointing relative to the Sun. Figure 15.16: Where sunlight reaches on spring equinox, summer solstice, vernal equinox, and winter solstice. The time is 9:00 pm Universal Time, at Greenwich, England. Heat can move in three different ways. We've already examined radiation, in which electromagnetic waves transfer heat between two objects. Conduction is a type of heat transfer that occurs when heat moves from areas of more heat to areas of less heat by direct contact. Warmer molecules vibrate more rapidly than cooler molecules. They collide directly with other nearby molecules, giving them some of their energy, which transfers heat. When all the molecules are moving at the same rate, the substance is the same temperature throughout. Heat in the atmosphere is transferred by conduction. This is more effective at lower altitudes where air molecules are packed more densely together. Conduction can transfer heat upward to where the molecules are spread further apart. It can also transfer heat laterally from a warmer to a cooler spot, where the molecules are moving less vigorously. The most important way heat is transferred in the atmosphere is by convection currents. Convection is the transfer of heat by movement of heated materials. The radiation of heat from the ground warms the air above it. This warmer air is less dense than the air above it and so it rises. As the heated air rises it begins to cool, since it is further from the heat source. As it cools, it contracts, becomes denser and sinks. Air moves horizontally between warm, rising air and cooler, sinking air. This entire structure is a convection cell. Not all energy coming in from the Sun makes it to the Earth's surface. About half is filtered out by the atmosphere. Besides being absorbed by gases, energy is reflected by clouds or is scattered. Scattering occurs when a light wave strikes a particle and bounces off in some other direction. Of the energy that strikes the ground, about 3% is reflected back into the atmosphere. The rest warms the soil, rock or water that it reaches. Some of the absorbed energy radiates back into the air as heat. These infrared wavelengths can only be seen by infrared sensors. It might occur to you that if solar energy continually enters the Earth's atmosphere and ground surface, then the planet must always be getting hotter. This is not true, because energy from the Earth escapes into space through the top of the atmosphere, just as energy from the Sun enters through the top of the atmosphere. If the amount that exits is equal to the amount that comes in, then there is no increase or decrease in average global temperature. This means that the planet's heat budget is in balance. If more energy comes in than goes out, the planet warms. If more energy goes out than comes in, the planet cools. To say that the Earth's heat budget is balanced ignores an important point. The amount of incoming solar energy varies at different latitudes (Figure 15.17). This is partly due to the seasons. At the equator, days are about the same length all year and the Sun is high in the sky. More sunlight hits the regions around the equator and air temperatures are warmer. At the poles, the Sun does not rise for months each year. Even when the Sun is out all day and night in the summer, it is at a very low angle in the sky. This means that not much solar radiation reaches the ground near the poles. Because of this, during a large part of the year, the polar areas are covered with ice and snow. These brilliant white substances have a high albedo and reflect solar energy back into the atmosphere. For all of these reasons, the region around the equator is much warmer than the areas at the poles. Figure 15.17: The average annual temperature of the Earth, showing that the equatorial region is much warmer than the polar regions. There is a roughly gradual temperature gradient from the low to the high latitudes. The difference in the amount of solar energy that the planet receives at different latitudes drives much of the activity that takes place at the Earth's surface. This includes the wind, water cycle, and ocean currents. The differences in solar energy around the globe drive the way the atmosphere circulates. The remaining factor in the Earth's heat budget s the role of greenhouse gases. Greenhouse gases warm the atmosphere by trapping heat. Sunlight strikes the ground, is converted to heat, and radiates back into the lower atmosphere. Some of the heat is trapped by greenhouse gases in the troposphere, and cannot exit into space. Like a blanket on a sleeping person, greenhouse gases act as insulation for the planet. The warming of the atmosphere due to insulation by greenhouse gases is called the greenhouse effect (Figure 15.18). Figure 15.18: The Earth's heat budget, showing the amount of energy coming into and going out of the Earth system and the importance of the greenhouse effect. The numbers are the amount of energy that is found in one square meter of that location. The greenhouse effect is very important, since without it the average temperature of the atmosphere would be about -18 °C (0 °F). With the greenhouse effect, the average temperature of the atmosphere is a pleasant 15 °C (59 °F). Without insulation, daytime temperatures would be very high and nighttime temperatures would be extremely low. This is the situation on all of the planets and moons that have no atmosphere. If the Earth did not have insulation, temperatures would likely be too cold and too variable for complex life forms. There are many important greenhouse gases in the atmosphere including CO2, H2O, methane, O3, nitrous oxides (NO and NO2), and chlorofluorocarbons (CFCs). All of these gases are a normal part of the atmosphere except CFCs, which are human-made. However, human activity has significantly raised the levels of many of these gases; for example, methane levels are about 2 1/2 times higher as a result of human activity. Table 15.2 shows how each greenhouse gas naturally enters the atmosphere. Different greenhouse gases have different abilities to trap heat. For example, one methane molecule can trap 23 times as much heat as one CO2 molecule. One CFC-12 molecule (a type of CFC) can trap 10,600 times as much heat as one CO2. Still, CO2 is a very important greenhouse gas because it is much more abundant in the atmosphere than the others. The greenhouse effect is very important for another reason. If greenhouse gases in the atmosphere increase, they trap more heat and warm the atmosphere. If greenhouse gases in the atmosphere decrease, less heat is trapped and the atmosphere cools. The increase or decrease of greenhouse gases in the atmosphere affect climate and weather the world over. All materials contain energy, which can radiate through space as electromagnetic waves. The wavelengths of energy that come from the Sun include visible light, which appears white but can be broken up into many colors. Ultraviolet waves are very high energy. The highest energy UV, UVC and some UVB, gets filtered out of incoming sunlight by ozone. More solar energy reaches the low latitudes and the redistribution of heat by convection drives the planet's air currents. Give a complete description of these three categories of energy relative to each other in terms of their wavelengths and energy: infrared, visible light, and ultraviolet. Why do the polar regions have high albedo? Give an example of the saying "energy can't be created or destroyed". Describe what happens to the temperature of a pot of water and to the state of the water as the dial on the stove is changed from no heat to the highest heat. Describe where the Sun is relative to the Earth on summer solstice, autumnal equinox, winter solstice and spring equinox. How much sunlight is the North pole getting on June 21? How much is the South pole getting on that same day? What is a planet's heat budget? Is Earth's heat budget balanced or not? On a map of average annual temperature, why are the lower latitudes so much warmer than the higher latitudes? Why is carbon dioxide the most important greenhouse gas? How does the amount of greenhouse gases in the atmosphere affect the atmosphere's temperature? The amount of light that reflects back off a surface; snow and ice have high albedo. Heat transfer between molecules in motion. Heat transfer by the movement of currents. A heat transfer unit in which warm material rises, cold material sinks, and material moves between the two to create a cell. Radiation travels in electromagnetic waves; waves that have both electrical and magnetic properties. The ability to work; energy is not created or destroyed but can be transferred from one form to another. The trapping of heat that is radiated out from the planet's surface by greenhouse gases in the atmosphere and moderates a planet's temperatures. A material that inhibits heat or electricity conduction so that the insulated object stays at its current temperature for longer. The energy taken in or released as a substance changes state from solid to liquid or liquid to gas. The movement of energy through a material or through space, as carried by electromagnetic waves. The return of a wave from a surface, such as a light wave from a mirror. The amount of energy needed to raise the temperature of 1 gram of material by 1 °C (1.8 °F). How does the difference in solar radiation that reaches the lower and upper latitudes explain the way the atmosphere circulates? How does the atmosphere protect life on Earth from harmful radiation and from extreme temperatures? What would the consequences be if the Earth's overall heat budget were not balanced? This page was last edited on 26 February 2018, at 13:13.